Muted aromas of toasted oats and dried apples on the nose. The mid-palate is juicy kumquats, salt, and wet shale melding into a grippey finish that lasts forever. 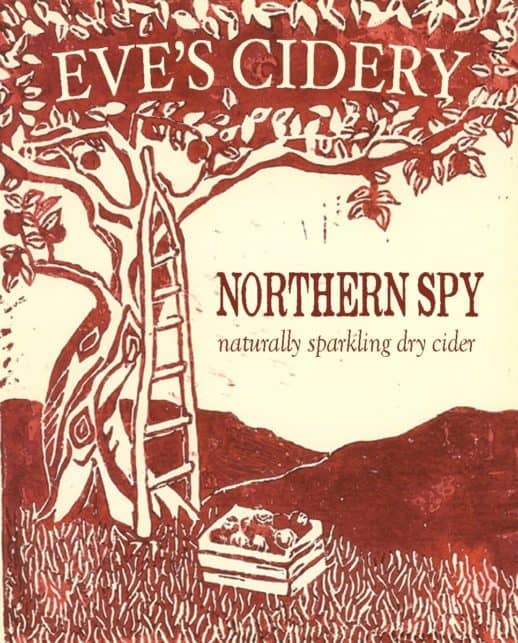 Northern Spy cider is the new American Champagne. Hand made in New York with apples grown in New York of an heirloom variety that originated in New York. Pair with oysters, ocean fish, fresh goat cheese or brunch. 2016 was one of our most challenging vintages to date. An early March warm up pushed bud phenology three weeks ahead of schedule, only to be followed by record breaking cold in early April, which killed buds and left us with 30% of a normal crop. As the growing season progressed, it got unusually hot and stopped raining. Four months without rain left our un-irrigated trees stressed and thirsty by fall, with a small crop of even smaller, dry apples. An early March warm up pushed bud phenology three weeks ahead of schedule, only to be followed by record breaking cold in early April, which killed buds and left us with 30% of a normal crop. As the growing season progressed, it got unusually hot and stopped raining. Four months without rain left our un-irrigated trees stressed and thirsty by fall, with a small crop of even smaller, dry apples. In some ways our 35-year-old Northern spy trees fared the best. Their late blooms meant better survival during the freeze. Their deep roots and strong frames gave them resiliency during the drought. The effect of heat and the drought was not to increase ripe fruity flavors, but instead to concentrate the mineral characteristics we love so much about this variety. There was certainly less water in the fruit, the low yields and higher alcohol content shows this. But the acid stayed high and there was little bitterness in the tannins. This particular bottling, of which there is a scant 50 cases, is a great example of how vintage variations can be expressed in cider. Partial primary fermentation in stainless steel – in bottle fermentation followed by hand disgorging.